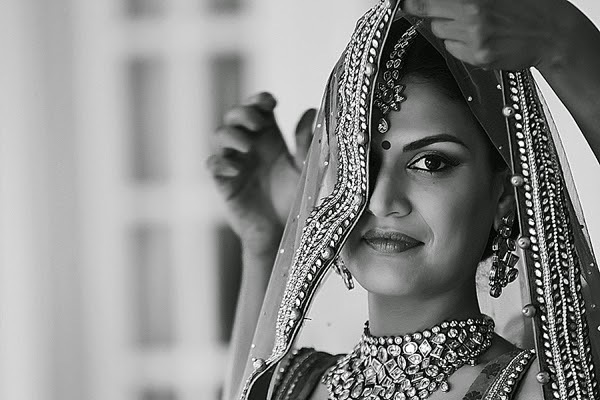 In her second installment of Modern Heritage, Veronica educates us on Indian wedding traditions with the help of some wonderful Indian wedding experts: wedding blog editor Sidra of Rubies and Ribbon and local wedding photographer Keith of Keith Cephus Photography. Indian weddings are popular celebrations here in Hampton Roads, but we commonly only get a glimpse at traditional American ones in the local media. So I'm ecstatic that Veronica has shined some light and paid tribute to such a symbolic and colorful celebration! I've always been fascinated with other cultures. I always dreamed of traveling all over the world, learning different languages, and experience for myself all that the world has to offer. And while my travel dreams haven't yet become a reality, researching and writing about weddings has given me the opportunity to explore those cultures in what I believe to be the most magical and beautiful moment in s person's life: their wedding! Anything that is bright and colorful always captures my attention. Naturally, for my next installment in this series, Indian weddings were first in mind. 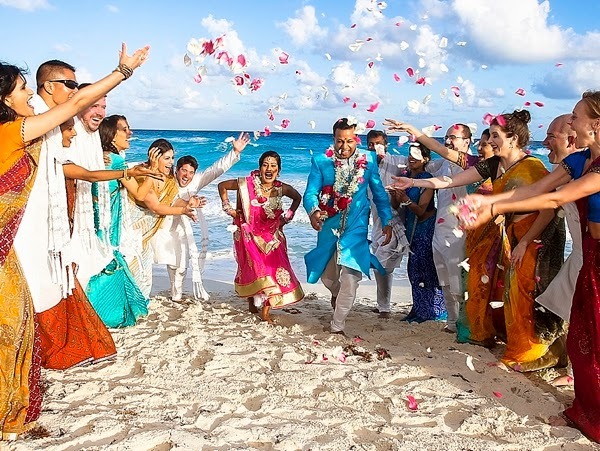 During my research, I learned that there are many subcultures in India, and that each wedding ceremony will draw traditions and ceremonies from different ethnicities and religions. So what I found is a more basic (yet still delightfully colorful and lively) break down of an Indian wedding. The celebration starts before the wedding ceremony with two rituals called Mehndi and Pitthi. 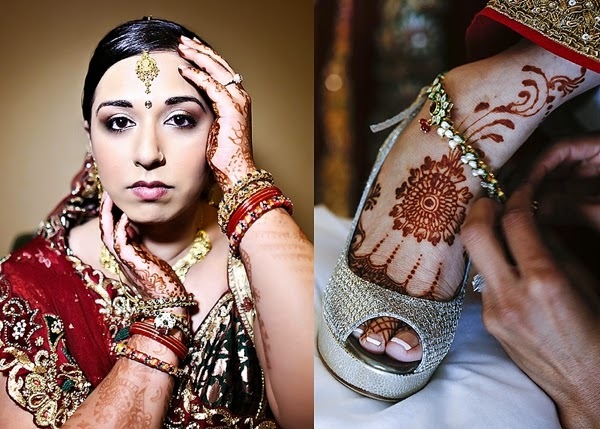 The Mehndi or Henna is typically applied to the bride by an artist or relative. This is done the night before the wedding, and the bride is usually surrounded by the women in her family. There is music and dancing. The Pitthi is a ritual performed for good luck. The families and friends of the bride and groom apply a paste to their faces usually a day or two before the wedding. This paste is thought to brighten and even the skin tone. The groom's procession known as the Baraat is a lively procession. The groom is accompanied by his family and friends, all singing and dancing around him. The beauty of this ritual is that it symbolizes the joy that the groom's family feels in joining the bride's family. The Milni is where the bride's family welcomes the groom and his family. It is such a loving ceremony full of flowers and garland, hugs and warm greetings. The groom is then escorted to the Mandap, a canopied altar, where he will marry his bride. With the priest's guidance, the parents of the bride and groom offer flowers, sweets, and prayers to the Lord Ganesh, destroyer of all obstacles. This prayer, Ganesh Puja, starts the ceremony. The arrival of the bride is called the Kanya Aagaman. The bride is escorted by her maternal uncle and aunt. This signifies the blessing and approval of their union by the maternal side of the bride's family. Jai Mala is the acceptance of each other in an exchange of garlands by the bride and groom. These beautiful floral garlands remain with the bride and groom for the rest of the wedding ceremony. The giving away of the bride or Kanyadaan is one of the most significant rituals. It is very emotional in a sense that the father or the bride is giving away his most precious gift to the groom. In this emotional ritual, the father places the bride's right hand in the groom's right hand and pours holy water on their palms. Other family members then unite the groom's scarf with the bride's sari, tying them together to signify their bond in marriage. The lighting of the sacred fire, Agni, is called the Vivah Havan. Agni signifies the presence of God at the ceremony as an eternal witness to the marriage. The priest lights the fire, and all commitments made in the presence of Agni are therefore made in the presence of God. The bride and groom then walk around the sacred fire seven times. This ritual called Mangal Phere, known as the Phera to some, is considered to be very important, as it signifies the bond that is made. With each encirclement, they keep in mind the four aspirations in life: Dharma, Artha, Karma, and Moksha. The bride leads the first three and the groom leads the last four encirclements. Each time they go around the Agni, they also pray for different things. The first for plenty of pure and nourishing food; the second for mental, physical, and spiritual health; the third for preserving wealth and prosperity; the fourth for happiness, harmony, mutual love, and trust; the fifth for the welfare of all living beings, and for virtuous and noble children; the sixth for a long joyous life together; and the seventh for understanding, companionship, loyalty, and unity. After they make their vows, the bride moves to the groom's left side, to be closer to his heart. The groom then offers the bride a mangasultra, a sacred necklace made of black and gold beads, signifying the groom's offering of lifelong protection and devotion. He then applies sindoor on the crown of her forehead, indicating the bride's status as a married woman. Finally, the ceremony ends with blessings. During the Aashirvaad, family members whisper blessings into the bride's ear, and the couple bows down to the priest and their parents for their final blessings. The couple is then showered with flowers and rice, this is a way for their guests to wish them a long and happy marriage. Since I don't personally have a connection to the Indian culture, I knew that I was going to need some help. So with Chelsea's help, I was able to collaborate with the wonderful lady behind Rubies and Ribbon named Sidra. I reached out to her to see what experience she has had with Indian weddings, and her response fortified my belief that weddings truly are about the joining of two families and each unique experience is beautiful in its own way. V: I want to know a little more about you, your work, and your involvement or experience in Indian weddings. S: I've been blogging about Indie and alternative South Asian weddings since 2011, and recently started my own wedding planning and design boutique, based in Toronto but available worldwide. V: During my research, I came across the basics, like the structure of an Indian wedding and a list of the rituals and ceremonies. In your opinion, what is the most important tradition, and why? S: In the Indian subcontinent (India, Pakistan, Bangladesh, and Sri Lanka), there are hundreds of cultures, languages, religions, and ethnicities. Each localized region will have their own take of the marriage ceremony, but the main features are drawn from religion. The Indian weddings most commonly portrayed on TV and in movies are Hindu weddings. Besides the actual wedding ceremony, I think the most important part of the day is when the groom and his family arrive with a processional at the venue. This is called the Baraat and is full of dancing and cheer-– and the occasional horse and elephant! The bride's family receives them at the venue entrance with hugs and flowers-– this is called the Milni. This illustrates how the day is about celebrating two families joining as one. V: Yes, I see that these traditions are also heavily centered around family. My personal favorite is the Baraat. It is just so lovely and colorful! Are there any other traditions worth noting? S: For Muslim and Sihk weddings, there is a tradition where after the ceremony, the bride leaves with the groom (and sometimes his family, too). For Muslim Indians, this is called the Rukhsati. It is quite a sad moment, as it represents the bride leaving her home to join another. There are usually lots of tears from the bride and her family. V: What is your favorite part of Indian wedding? 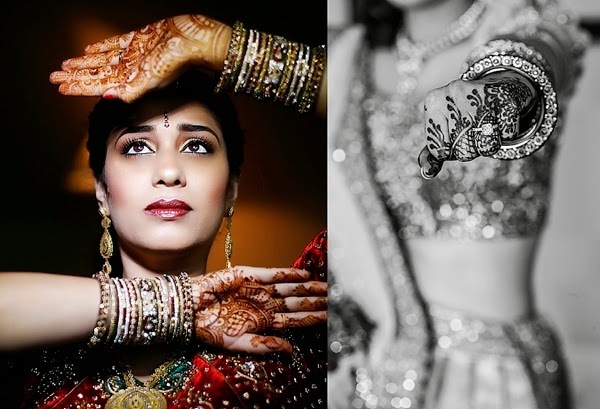 If you could take any part of an Indian wedding and incorporate it into an ordinary wedding, what would it be? S: I have so many! The sweetest is probably the Arsi Mashaf-– right after the marriage ceremony, the bride and groom are given a mirror where they take a peek at each other, and the groom pays compliments to the bride. The bride is usually wearing a veil covering her face at this point, so the groom is the first person to see her (in the mirror) after the ceremony. Sidra was a great in helping me realize that there is just so much more to Indian weddings than what we see on TV. And this realization has made me love and respect the culture so much more, especially since my own Mexican heritage shares the same love of bright colors and importance of family. I can't wait to learn a whole lot more and share it with you. All photos by Keith Cephus.